Grand Mufti Ahmad Badreddin Hassoun of Syria. The civil war in Syria is witnessing the participation of representatives of the most varied faiths and from all sides. Some of the conflicting sides are using religious slogans for mobilizing their adherents. Syrian Grand Mufti Ahmad Badreddin Hassoun speaks about how to stop the bloodshed and why the root of the conflict lies not only in religious antagonisms. 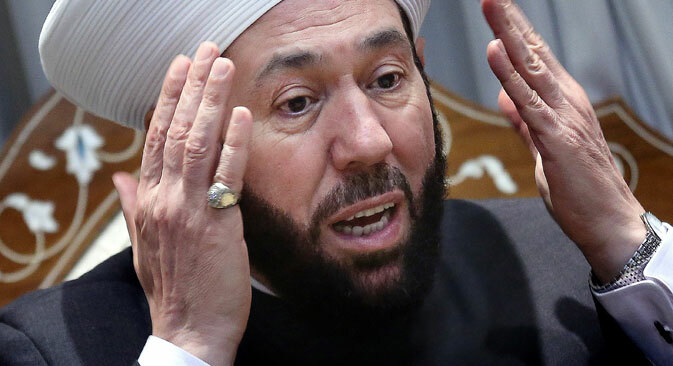 Syrian Grand Mufti Ahmad Badreddin Hassoun is a firm supporter of Syrian President Bashar al-Assad. He has been to Russia several times and once even gave a sermon in Chechnya's main mosque, the Heart of Chechnya. The online newspaper Gazeta.ru recently spoke to the religious figure, who wields significant authority among Sunnis, about the processes taking place in Syria and in the Middle East in general. There is a common narrative that the civil war taking place in Syria is an interreligious conflict. Is this so? It is true that in the four years of the war it has always been depicted as an interreligious war. But it's not so. Everyone is running from the places controlled by the Islamic State (IS) or the al-Nusra Front: Christians, Sunnis and Alawites. And they are running to places where the Syrian army is established. The provinces of Al-Raqqah and Idlib are regions where only Sunnis live, yet for some reason those same Sunnis are running away from the al-Nusra Front, which positions itself as the "protector of the Sunnis." Syria is a secular state and 70 years ago we even had a Christian prime minister. We are currently the only country in the Middle East where children in school have only one subject on religion. In the universities Christians and Muslims study together. In order to enter the government it is not necessary to represent one faith or another. How would you then characterize this conflict? The war is now being fought between religious terrorism and the secular government. The war in Syria is not an interreligious war and not a war to topple Assad. It is a war to destroy Syria as the last secular government in the Middle East. All the other Middle Eastern countries became states with a defined religious order a long time ago. This is the case even for Lebanon. It is clearly divided according to religion in several parts: the former president was a Maronite Christian, the speaker of parliament is a Shiite and it is only this balance that helps maintain peace there. In Jordan the king must be a Hashemite. In Saudi Arabia the ruling dynasty is Sunni and must be composed of members of the Saudi family. In Iraq the president must be a Sunni and the prime minister a Shiite. In Turkey the president must only be a Muslim. Syria remains the only country where the president and the prime minister can be Christians or Shiites or Alawites or Sunnis or even atheists. They want to divide us into several religious quasi-states. Why then did the war begin and why are government opposition so strong? In this sense, what is happening in our country has a non-Syrian nature. It is enough to say that from the first day of the war there were two bases: one in Jordan and another in Turkey. For three years Syria had resisted all these forces rather successfully. Then they provoked the entry of the IS into our country. Now there are 30,000 Uyghur Muslims from China and militants from Chechnya, the UK and a series of European countries fighting against us. They are all killing people regardless of the faiths that the victims adhere to. By the way, these terrorists have killed more Sunnis during the war than anyone else. When representatives of Saudi Arabia said that Russia is supporting the Shiites against the Sunnis, Putin correctly responded that Russia is just supporting the Syrians in their war against terrorists and not the government of the country or the Shiites or anyone else. You are an Alawite or a Sunni? A Sunni. But this has no significance for me in the context of the current situation in my country. Once some Saudi TV personalities called me a "mufti for Syrian Sunnis." I told them that I am not a mufti for Syrian Sunnis but a mufti for all of the Syrian people. Among my parishioners are Muslims, Christians and even those that do not profess a faith in any God. They are all my people. At the very beginning of the conflict the Minister of Defense Dawoud Rajiha, who was an Orthodox Christian, was killed in a terrorist attack. His widow and daughters now come to me and say, "You are our patriarch." What must be done in your opinion in order to reconcile people of various creeds in the Middle East? We need to reeducate the youth and constantly work with young people. Furthermore, we need to separate religion and politics. On the one hand we must make sure that the government's secular character does not mean a battle against religion and on the other, we must make sure that religion serves man, not serves to control him. Just as Jesus did not speak of a state only for Christians, Mohammed did not create a state only for Muslims and Moses did not establish a country only for Jews. They created secular governments. Recently President Putin inaugurated a big wonderful mosque. This is good. But trust me, if they had built a big factory for producing medicine and a small mosque, this would have been even better. I think that if Jesus and Mohammed were to reappear, they would not go to the mosque or to the church. They would go, for example, to the stadiums, which are filled with lots of people and they would hold their prayers and sermons there. Do you forgive those Syrians who fought for IS or for other Islamist groups but then renounced their activity and surrendered to the government forces? Every week I dedicate my talks to this and call on them to do this. Hundreds of such Syrians come over to our side regularly and we forgive them. The way to the homeland is open for everyone and no one has any problem with this.